Leaders of Poland’s right-wing government marked the nation’s centenary with a military parade Sunday (11 November), which took place at the same time and along the same route as an annual independence day march organised by marginal far-right groups. 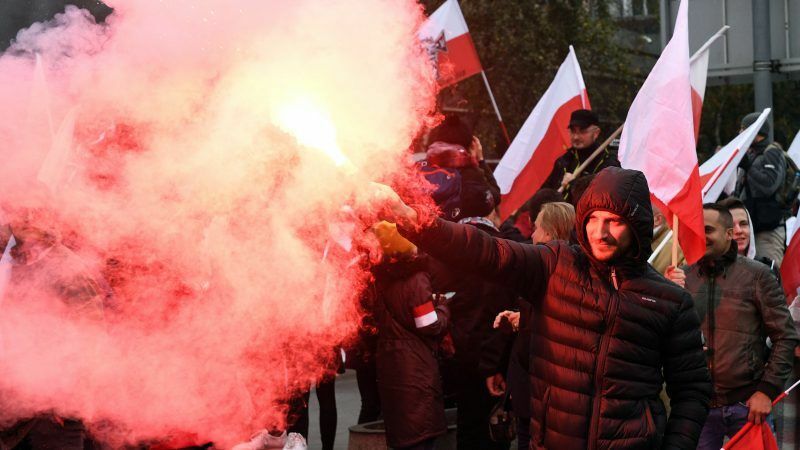 Across the country on the stroke of noon Poles stopped to sing the national anthem in a rare show of unity, while marchers in Warsaw carried red and white Polish flags and set off flares to mark the centenary, filling the streets with crimson smoke. Authorities said an estimated total of 200,000 Poles joined the state military parade, which effectively combined with the march organised by the anti-EU far-right groups. The anniversary comes as Poland has become isolated within the the European Union bloc and deeply polarised internally under the right-wing Law and Justice (PiS) party, whose controversial judicial reforms have put the country on a collision course with Brussels. Before November 1918, Poland had not existed at all for 123 years, having been carved up between the Prussian, Russian and Austro-Hungarian empires. Many marchers on Sunday insisted they were conservatives without far-right sympathies who simply wanted to celebrate the centenary. “I’m proud to be Polish to show it. As Poles, we’ve always bickered among ourselves, but on this day we should be together,” Mariusz, 35, who travelled to Warsaw from Britain, told AFP. Held under heavy security, the event also drew members of European far-right groups including ones from the Netherlands and Italy’s Forza Nuova from Italy, among others who chanted anti-EU slogans. “We came because we share the same values, the Catholic religion and national values,” Salvatore Ferrara from Italy’s neo-fascist Forza Nuova, told AFP. Last year’s edition of the march triggered global outrage when some participants displayed racist and anti-immigrant banners and slogans. Explicitly racist or anti-immigrant symbolism was not visible during Sunday’s march, but some far-right groups including Forza Nuova and Polish organisers of the march, the National Radical Camp (ONR), carried flags and banners showing their symbols and opposition to the EU. This for me is the scariest photo from today's Independence March, led by the Polish President, PM & govmt officials. Polish soldiers marching – literally – under the flags of Forza Nuova, an Italian nazi-fascist party, to celebrate 100 years of Poland's independence. The ONR, a marginal group with roots in an anti-Semitic pre-World War II movement, struck a last-minute deal on Friday with the PiS government vowing to ban hate speech and fascist symbols. Both are outlawed in Poland. 80 years ago they terrorised Jews and called them 'parasites' that should be removed from Poland. This year they told President Duda to 'take off your yarmulke' and called for an ethnically pure Poland. The march coincided with the hastily-called military parade led by President Andrzej Duda that also included Jarosław Kaczyński, the powerful PiS leader and Prime Minister Mateusz Morawiecki. Duda and Morawiecki only organised the parade on Wednesday when it became clear that the independence day march called by the ONR among others would dominate centenary celebrations in Warsaw. The US, Canadian and Ukrainian embassies issued warnings about the possibility of violence in connection with the march, which did not materialise. 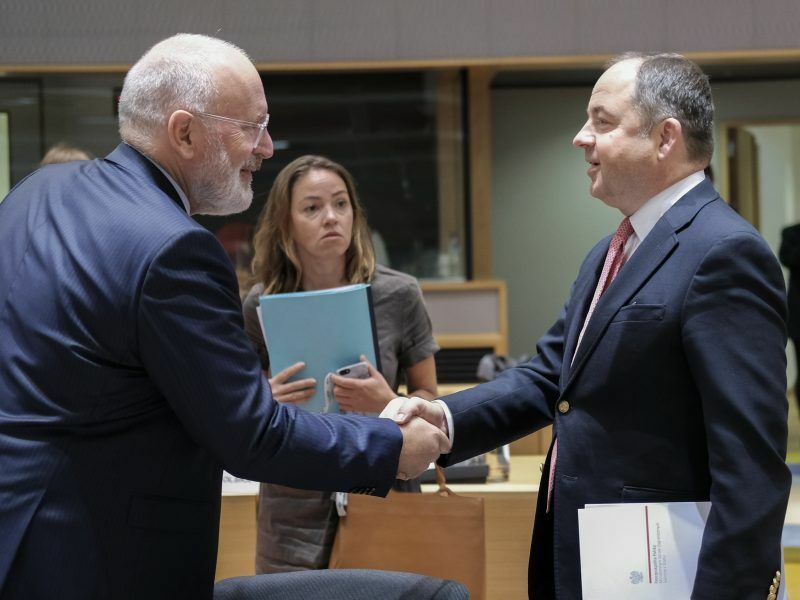 Underscoring Poland’s growing isolation in the EU since the PiS took office in 2015, no senior delegations from fellow EU states showed up for the centenary event, which coincided with commemorations to mark the 100th anniversary of the end of World War I. US President Donald Trump, who has courted the eurosceptic PiS, tweeted his congratulations and hailed Poland “great country”. The PiS government has antagonised the EU by introducing a string of controversial judicial reforms that Brussels has warned pose a threat to judicial independence, the rule of law and ultimately to democracy. EU President Donald Tusk, a former liberal Polish prime minister, was the bloc’s only senior representative in Warsaw on Sunday amid speculation that he may return to run for president in 2020. “Forgive us Poland… we love you!” Tusk said urging national unity, remarking that Poles “sometimes argue too much” about their country. He has repeatedly warned that the PiS could unwittingly unleash a “Polexit” from the EU despite its strong popularity among Poles and the many assurances of PiS leader Jarosław Kaczyński that his party has no such designs. Let’s celebrate our freedom every year on Europe Day thanks to a united Europe, with big music parades in all 28 EU capitals (and subtle messages about the EU on floats), to be organized by the youth, because they represent HOPE! And music unites, military doesn’t!! And make Europe Day a free public holiday across Europa, so people can participate wherever in the EU.